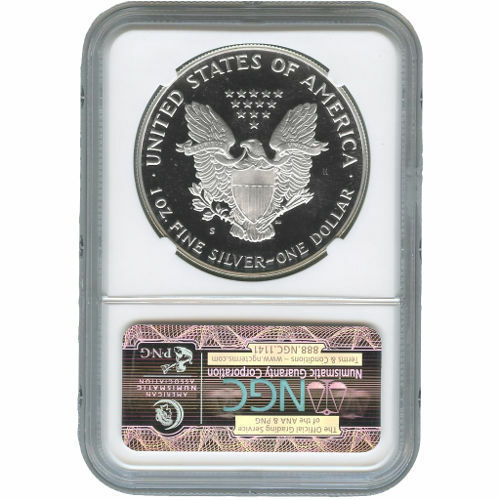 NOTE – NGC produced a variety of labels for this date/mint-mark coin, so we cannot guarantee which exact label you receive. 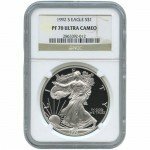 You are guaranteed to receive a 2012-S NGC PF70 Silver Eagle. The 2012-S 1 oz Proof Silver American Eagle coin is available from Silver.com with a PF70 grade from the Numismatic Guaranty Corporation. These coins are considered perfectly struck proofs with an Ultra Cameo appearance which classifies each coin as having a strong, frosted design set against a deeply mirrored, clear field in the background. 2012 coins with the “S” mint mark were struck at the San Francisco Mint to celebrate their 75th Anniversary. Congress authorized the Silver American Eagle with passage of the Liberty Coin Act of 1985, allowing the US Mint and the Treasury Department to access silver stores from the Defense National Stockpile to produce the coins. The program has been so popular that it was extended by Congress in 2002. On the obverse of each Silver American Eagle Coin is the depiction of Walking Liberty. Lady Liberty is shown in a gown emerging from the rising sun. She carries with her oak and laurel branches. This side is struck with the word “Liberty,” the phrase “In God We Trust,” and the year of minting which is 2012. The reverse bears John Mercanti’s heraldic eagle design from 1986. In the image, the eagle is situated directly behind a shield, clutching arrows and an olive branch in its talons. Above its head are stars, representing America’s original thirteen colonies. Engravings here include “United States of America” and “1 OZ FINE SILVER ~ ONE DOLLAR.” There is also an “S” marked below the eagle’s right talon for the San Francisco Mint and a JM marked below its other talon for John Mercanti. If you have questions about this coin for Silver.com associates, simply call us toll-free at 888-989-7223. You can also contact us online through our live web chat feature or email. 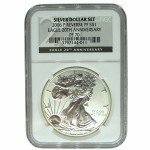 Make sure you also look over our entire collection of Certified Proof Silver Eagles for more similar coins.